Nectarines are in season over summer months and are a good source of Vitamins A and C and dietary fibre. Tangy-sweet and very juicy, ripe nectarines have a firm texture and light fibrous flesh that increases their versatility. Their flavour can be used to highlight Asian style dishes and the texture of Nectarines makes them very useful raw in fruit or vegetable salads. They can also be grilled on the barbecue to accompany meat dishes or skewered and grilled on kebab. Nectarines can be preserved in a light syrup or made into chutney and jams to serve alongside fish, poultry or meat dishes. We thought you might like to try them in a bean salad. Black beans offer a contrast in colour but other varieties of pulses such as lima or cannellini beans, mixed bean salads, chick peas or lentils would also be fine. Toss the beans, onions, nectarines and coriander into a mixing bowl. Combine the oil, juice, cumin and taco sauce in a cup, stir well to make a dressing. Arrange the lettuce cups either on plates for separate servings or in the base of a salad bowl. Spoon the salad into the lettuce cups and serve or chill covered until required. Each serving contains: Energy 178kcals/745 kJ; Protein 10.5g; Fat 2.5g; Carbohydrate 27.5g; Dietary fibre 10g; Sodium 157mg. 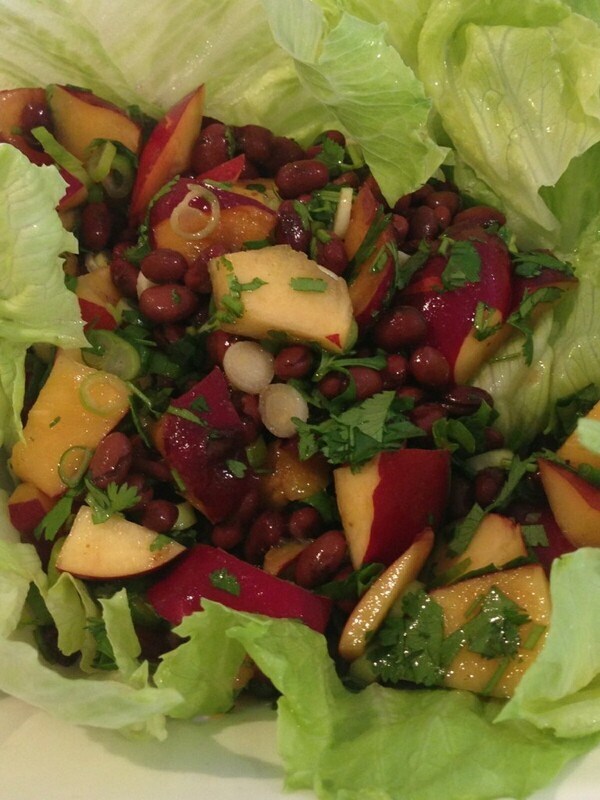 This salad lends itself to any raw stone fruit such as peaches, apricots, plums or mangoes. The sesame oil can be replaced with either other nutty tasting varieties such as walnut or grape seed or citrus infused avocado or olive oils (e.g.lime, lemon or orange). If you would like to extend the salad without increasing the energy level significantly then add diced cucumber or courgettes.